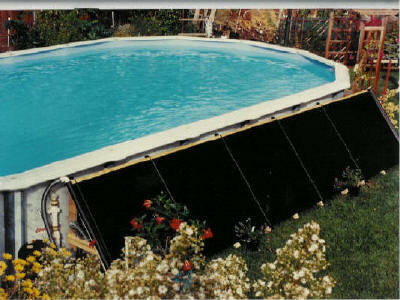 Solar heating an above ground pool is usually easier than an in-ground pool. They are used seasonally: generally from Memorial Day to Labor Day only. There are systems out there specifically designed to heat AGPs and, likewise, systems designed to heat IGPs. You first need to decide whether you are looking for the cheapest option to add some heat to your pool or if you want to get the most you can from solar heating. If you are heating an AGP in the NW High Desert please visit our High Desert Solar page for further information or click the hyperlink to the left. Qualify for solar incentive programs if available in your area (OR 50% up to $1500; HI 35% up to $1750. Many utilities also offering rebates. (see RE Incentives for more information). Factoring in these incentives, cost is often lower for IGP panels vs. AGP. FAFCO's IGP panels have a 12 year full warranty (parts and labor) while their AGP panels have a 10-year prorated warranty (go down 10% per year). However, for smaller above ground pools where you are looking for an inexpensive way to add up to 10 degrees to your pool, these AGP panels are terrific!! See below. AGP panel laying flat on the ground next to pool. Finally, a high performance, easy- to-install, and economical solar system for above ground pools (AGP)! A SunSaver system will extend your swim season by adding heat to your pool to a warm, comfortable temperature from spring into fall (depending on location). Solar heating an above ground pool is somewhat different than an in-ground. For one, you have two types of panels to consider, those specifically designed for above ground pools (AGP) and those first designed for inground pools (IGP). FAFCO has two SunSaver AGP panels called the "Plus" & "economy". We recommend using the "economy" panels in our general market area where cost is a consideration considering our short swim season. In addition, we only stock the "economy" panels and our dealers only stock and/or sell them; the Plus would need to be ordered separately and shipped from the factory and is considerably more expensive and, frankly, not worth the extra money..
Like all other FAFCO products, these AGP panels are sold only through qualified dealers in OR, WA, ID, HI, MT, WY, and CO. Contact a local pool product dealer or ecosystems for recommended sizing and plumbing designs. For a list of dealers in your area, contact us. When sizing according to published SunSaver sizing charts on the product box, brochures, and installation manuals, understand that these are generic charts based on sunbelt climates. They are often less accurate in NW and mountain environments. Please take this into consideration when ordering your system. Panels can be installed anywhere on the ground next to the pool (most common), on a rack, or on a roof. If mounted to a rack or roof, panel should be strapped down using a roof/rack mounting kit #963. We don't recommend putting more then two of the 4x20 AGP panels in series or four in parallel. In series flow, the pool water flows from one panel into the next so the first panel "preheats" the second and so on (see add-on kit #961). Thus, each panel downstream has diminished solar collection capability. Series flow can also restrict the amount of flow through multiple panels. In parallel flow, the panels are fed and returned individually so that each one receives the same pool water and so their performance is identical for each panel and maximized; flow is not restricted. We suggest using only up to four AGP panels in parallel because, if that much panel surface area is needed, it would probably be better to use IGP panels instead mainly because they should not be permanently mounted and thus need to be removed every fall and reinstalled every spring, what a hassle (see below). Such is the case for some of the larger above ground pools such as a 16x32, 20 round, or 24 round, etc. 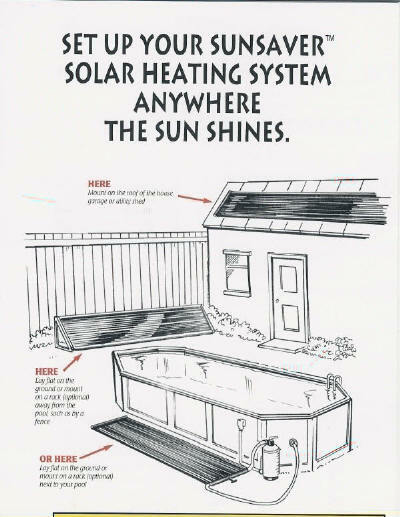 (see Solar Heating In-ground Pools). Don't forget, these 4x20 panels are limited in that they cannot be permanently mounted to any surface in any area where freezing can occur due to their inability to self-drain. In other words, they need to be removed and stored in a non-freezing location over the winter. If you would prefer not to deal with this maintenance issue, you can always opt to use the SunSaver IGP panels on your AGP. If mounted on a minimum 6o pitched surface, these 4x8, 4x10, or 4x12 panels automatically drain and thus can be installed permanently. The reason they are all SunSaver panels is that they are use the same material and tube design (see IGP panels); only the header and mounting procedure is different. In brief, for low cost and simplicity, use the AGP panels. For a permanently mounted system that surely qualifies for solar tax credits in Oregon and Hawaii (see Energy Tax Credits), use the SunSaver IGP panels sized appropriately for the surface area of your pool. For questions, contact us. Copyright © 2001 ecosystems. All rights reserved.